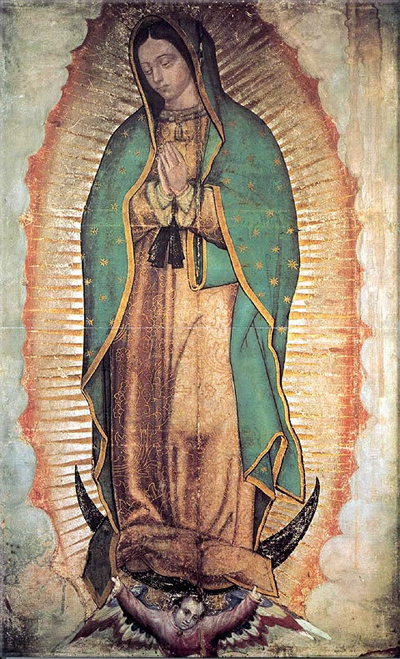 The iconography of heaven referenced in my post for the Immaculate Conception, particularly as it relates to the Miraculous Medal, finds an antecedent in the miraculous image of Our Lady of Guadalupe that was painted on St. Juan Diego’s tilma by the Virgin Herself. She is clothed with the sun and is standing on the moon. 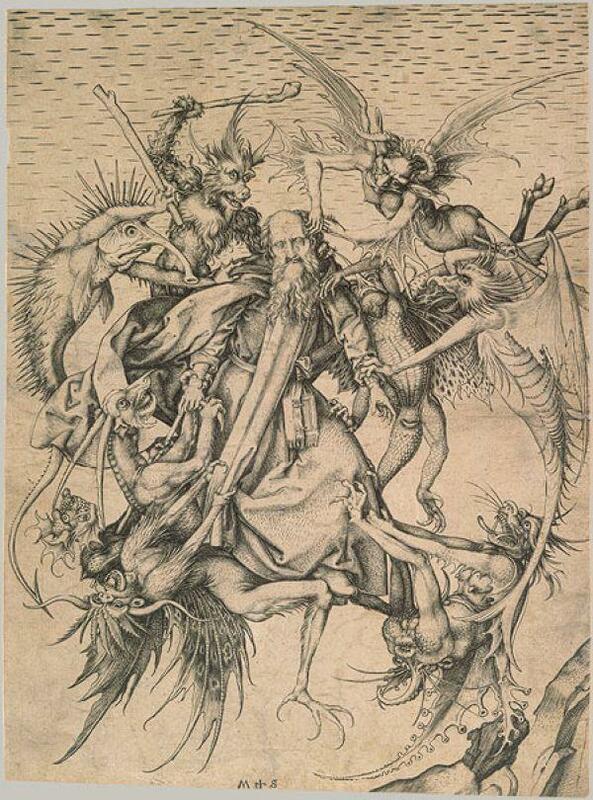 Though the artists rendition above includes the serpentine imagery from Apocalypse 12, the actual image on the tilma has no depiction of the serpent. One might think that any reference to Genesis 3:15 is only indirect by way of the allusion through the commonality of The Woman. But not so. In fact, the heavenly iconography of Guadalupe passes from the prophecy of Genesis and the vision of St. John right into the history that it was intended to address. The image itself is a miracle that manifests and perpetuates the Virgin’s presence. We see what Juan Diego saw. 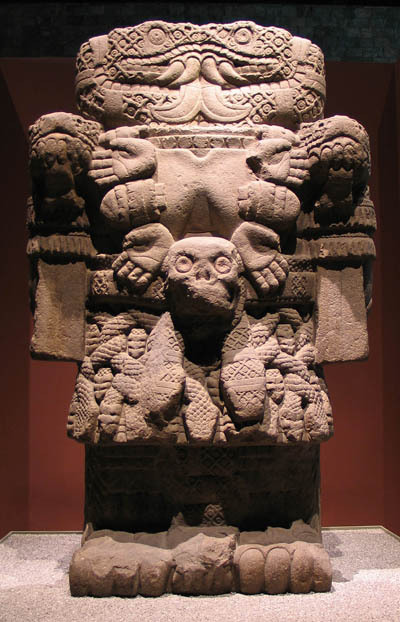 Once Our Lady’s command to build a temple was obeyed, the image came to rest on Tepeyac Hill, where formerly, before the conquest of Mexico by Cortes, there had been a shrine to the Aztec goddess Coatlicue (below). Yes, she is the mother goddess with two serpent heads who wears a snake skirt and human body parts for a necklace. There is a sense in which this idol (image) completes the iconography of the Virgin, insofar as image of cactus cloth smashes the stone idol. According to Carl Anderson and Msgr. Eduardo Chávez, the glyph for a conquered civilization was a burning temple turned on its side. The building of a new temple, the original of which was completed within two weeks of the apparitions, was the sign of a new beginning, the founding of a civilization of love. The serpent is not in the icon because the very icon itself is what crushes his head, through the force of Our Lady’s mediation. 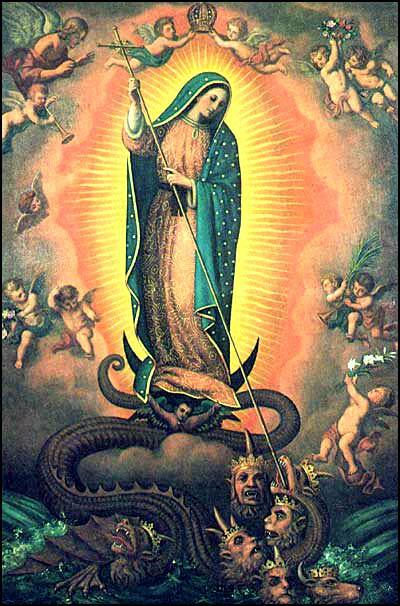 Think about this: Juan Diego was given a mission to be Our Lady’s instrument to crush the serpent’s head in New Spain. He simply obeyed in trust and total abandonment. All he really needed to do was take the message to the bishop. 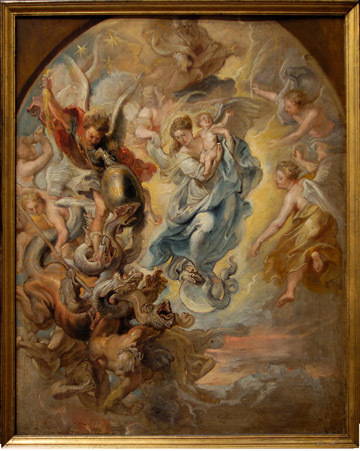 The result was that the image was produced miraculously and then placed where our Lady wanted it, right over the serpent’s head, over the mockery of truth, life, beauty and motherhood. Devotion to Mary is smashing dragons. Click here for a homily of mine for the Feast of Our Lady of Guadalupe.